a cavity or chamber. adj., adj an´tral. antrum of Highmore maxillary sinus. mastoid antrum an air space in the mastoid portion of the temporal bone communicating with the middle ear and the mastoid cells. antrum maxilla´re (maxillary antrum) maxillary sinus. 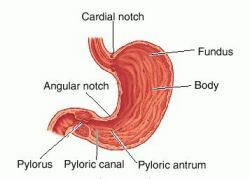 pyloric antrum (antrum pylo´ricum) the proximal, expanded portion of the pyloric part of the stomach. tympanic antrum (antrum tympa´nicum) mastoid antrum. (an'trŭm, -trī, -tră), [TA] Do not confuse this word with atrium. 1. Any nearly or relatively closed cavity. cardiac antrum the short conical portion of the esophagus below the diaphragm, its base being continuous with the cardiac orifice of the stomach. frontal antrum see under sinus. mastoid antrum , antrum mastoi´deum an air space in the mastoid portion of the temporal bone communicating with the tympanic cavity and the mastoid cells. antrum maxilla´re , maxillary antrum maxillary sinus. pyloric antrum , antrum pylo´ricum the dilated portion of the pyloric part of the stomach, between the body of the stomach and the pyloric canal. tympanic antrum , antrum tympa´nicum mastoid a. 1. A cavity or chamber, especially one in a bone. 2. Either of the sinuses in the bones of the upper jaw, opening into the nasal cavity. a cavity or chamber that is nearly closed and usually surrounded by bone. The antrum cardiacum is a dilation of the esophagus. The fluid-filled cavity in a mature graafian follicle is also termed an antrum. 1. Any nearly closed cavity, particularly one with bony walls. A hollow cavity or sinus in a bone. The maxillary antrums (or antra) are the cavities in the cheek bones. The mastoid bones, below and behind the ears, contain the mastoid antrums (antra). From the Latin antrum , a cave. , pl. antra (an'trŭm, -tră) [TA] Do not confuse this word with atrium. Any nearly or relatively closed cavity. n a general term for cavity or chamber that may have specific meaning in referencing certain organs or sites in the body. For example, referring to paranasal sinuses, the maxillary sinus can be referred to as a maxillary antrum. pl. antra [L.] a cavity or chamber. an air space in the human mastoid portion of the temporal bone communicating with the middle ear and the mastoid cells. maxillary sinus, especially of humans. the lumen of the pyloric part of the stomach; the pump of the stomach, regulating the propulsion of food through the pylorus into the duodenum.